Participants in last year's fun run. SAN FRANCISCO — Early bird registration for the second annual S.F. Aloha 5K Fun Run has been extended to Friday, Sept. 7. 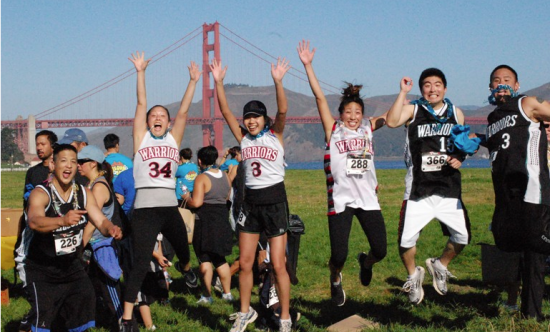 On Saturday, Oct. 13, at scenic Crissy Field in the Presidio of San Francisco, with the Golden Gate Bridge as the backdrop, runners/walkers of all abilities will enjoy Hawaiian entertainment and treats. The run starts promptly at 8:30 a.m. The course will begin at the north side of Crissy Field, running toward the Golden Gate Bridge, then looping onto Mason Street, turning at the Crissy Field Center for the last mile back down the Golden Gate Promenade, and ending on the south side of Crissy Field. All runners/walkers will receive a commemorative T-shirt and goodies from the sponsors. Post-5K celebrations will include beverages and Hawaiian-style snacks, Hawaiian music and Keiki’s Corner, providing activities for those young in age and young at heart. Prizes will be awarded to the top adult male and female finisher, top youth male and female finisher (under age 14), youth with most aloha spirit, and family with most aloha spirit. Aloha spirit is open for creative interpretation, so have fun with it! Online — Click here. Registration will close on Oct. 10 or when maximum capacity is reached. By mail — Download registration form and submit along with your check payable to “JCYC.” Send completed form and payment to JCYC, 2012 Pine St., San Francisco, CA 94115. Must be postmarked by Friday, Oct. 5. Proceeds will support the services of Japanese Community Youth Council (www.jcyc.org). JCYC is a San Francisco-based children and youth non-profit organization that provides a comprehensive continuum of care from pre-school to college and empowers young people to realize their full potential. Established in 1970, JCYC annually serves over 8,000 youth from all socio-economic and ethnic backgrounds. It has become one of San Francisco’s most successful youth organizations. Services include childcare, college preparation, leadership development, substance abuse prevention, summer daycamp, and youth employment.